Shuteriqi’s fictional works were mainly written in prose. Through his talent and rich culture he created popular and acclaimed short stories, which were widely published during his time. Some short stories and novels have also been published posthumously. 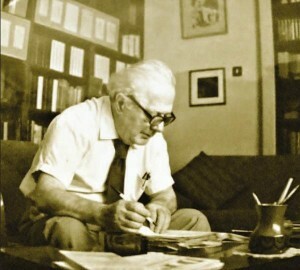 His novels attracted the attention of Albanian producers, who used his works as basis for some of the most popular cinematographic realizations of the time. Shuteriqi is also renowned for his extensive and multi-faceted scientific works, which are well recognized in the fields of language, literary historiography and folklore. His great work has shed light over the beginnings of the Albanian writing especially with Shkrimet shqipe 1332-1850 (Written Albanian works from 1332 to 1850) and Tekstet shqipe dhe shkrimi shqip 879-1800 (Written Albanian works and the written Albanian language from 879 to 1800). These works have uncovered the roots of the Albanian literary tradition and culture, have introduced prominent figures of the Medieval and Renaissance national literature, and have developed the study of our folklore. Through Shuteriqi’s works the Albanian public was introduced to new literary sources, little known or unknown antique manuscripts written in Albanian and scientific contemporary concepts. It was exactly this kind of work that caused his colleagues to dub him “The last Renaissance man”.